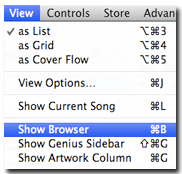 You know that cool minibrowser that you see at the top of your Music library? You can use it to see all the genres, artists, and albums in the current group of tracks. It’s a pretty handy way to “drill down” into your collection. By default it does not display when you’re viewing one of your own playlists. But that doesn’t mean it’s not there. Just click View and then Show Browser (or Apple+B for Mac users) and there you go. Getting rid of it is fairly obvious: just click View and then choose Hide Browser and it will disappear.